If you are in a hunt for reliable marketing data for your multi-channel promotion initiatives in Italy, Blue Mail Media could be the end of your search. We provide one of the most reliable, authentic and result oriented Database of Italian Business Executives which gives you complete access to all relevant information to reach out to your potential market via telephone, email or mail. Our Italy Business Mailing List is guaranteed to help you achieve better response rates on your campaigns and eventually shore up conversions. With our Italian Business Email Database, you can connect with key decision makers, C- Level Executives and professionals involved in numerous industry verticals across Italy. Since inception, Blue Mail Media has carved a niche in helping business organizations with qualitative B2B marketing data. Our List of Italian Business Executives will help you tap greater business opportunities in the Italian market and help you discover new avenues of revenue. Blue Mail Media has been able to build a strong network of data partners across USA, UK, Canada, Europe, North America, APAC and other regions, which allows us to serve clients beyond geographical constraints. Our proficient team of data scientists, subject matter experts, and professionals leave no stones unturned in accumulating high-quality data from reliable sources, verifying data for accuracy and updating the same on a regular basis. 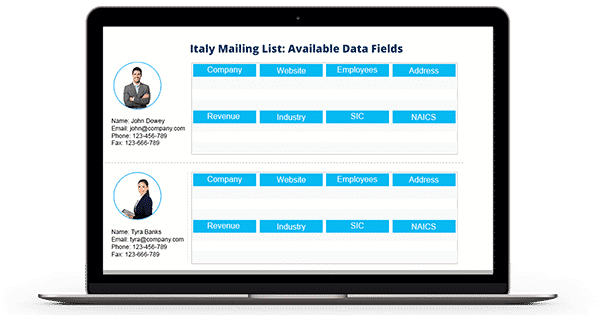 With Blue Mail Media, you can avail a pre-packaged list of Italian Business Mailing Addresses or you can opt for a list customized to you campaign specific requirements.